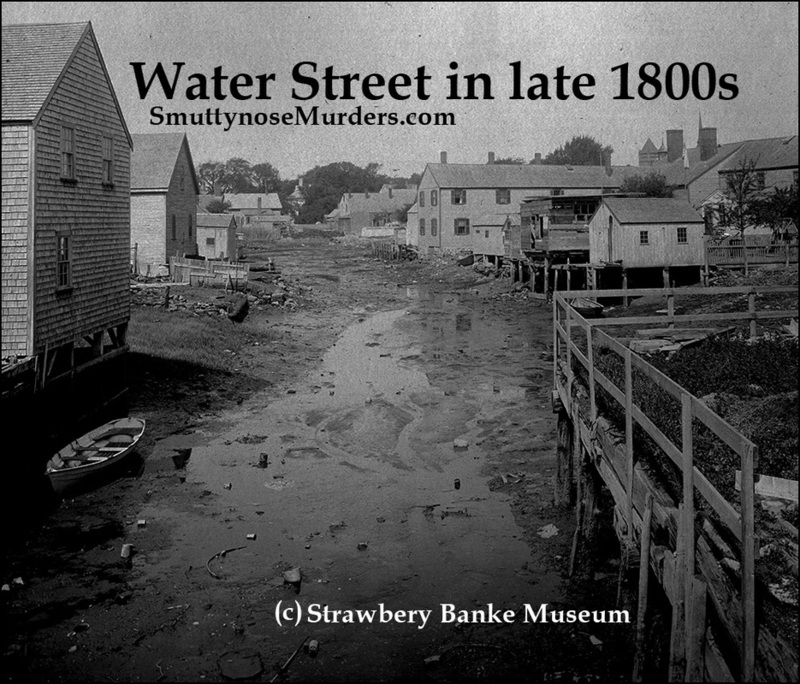 According to Louis Wagner's unsubstantiated alibi, he was in Portsmouth the night of the murders on Smuttynose Island. He claimed to have been baiting hooks for an unknown fisherman on an unknown boat at an unknown pier. He drank at an unknown bar, got sick, wandered around town, fell down near the town pump, and lay on the frozen ground for over an hour. Then he stumbled home to Johnson's Boarding House on Water Street, a five minute walk that took him nearly an hour. He went in the back door that the landlady said was locked. He did not go up to his room where two other seamen were sleeping. Instead, Wagner said, he dozed on a sofa in Matthew's Johnson's shop downstairs, before getting up, wandering down Water Street, and coming back to the boarding house early in the morning. Let's ignore, for a moment, the fact that Wagner was seen by at least seven witnesses coming from New Castle, NH on the morning of the murders. Let's ignore the fact that he was missing for 11 hours and could not come up with a single witness who had seen him in Portsmouth that night. Ignore Maren's Honvet's "ear-witness" testimony and Anethe Christensen's dying scream of "Louis! Louis! Louis!" Let's remember that John Hontvet and two other men were baiting hundreds of hooks in the very next room from where Wagner says he slept on the sofa. Wagner testified that he could see his best friends baiting hooks through the window in Matthew Johnson's shop. He had promised to return to help them and had desperately needed the money. But he claimed that he was too sick after drinking a beer to join the fisherman early that morning, or even to identify himself. John Hontvet testified at trial that he went in and out of the room with the sofa to get water from a pitcher on the bar. And George Lowd, a relative of the landlord who helped bait hooks, said he fell asleep on the same sofa during the same hours that Wagner claimed he was there. Is it possible Lowd was lying? Sure. Is it possible that Ann Johnson and her daughter did not lock the back door at midnight as they testified under oath? I guess. Could Wagner have dozed on the sofa because he was too sick to walk up a flight of stairs to his bedroom on that fateful night? Maybe. So what happened to the sofa? An article in an old New Hampshire Profiles magazine shows what may have been the sofa once located at 25 Water Street. 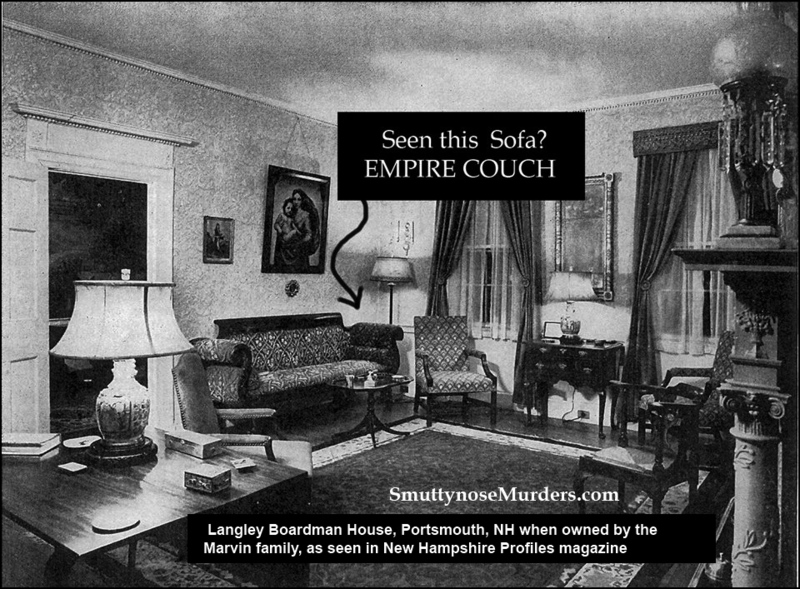 The empire-style couch with "profuse carvings" and claw feet was reportedly sold to the Marvin family of Portsmouth. They had it restored and moved to the brick Langley Boardman House on Middle Street. That house is now owned by NH Senator Martha Fuller Clark.But she doesn't have the sofa. It has not been seen in decades. Maybe you know where it is. It was reportedly given by Admiral Lord Nelson to his niece who came to Portsmouth in 1810 and married a man named Johnson. That could be one more local tall tale. Or maybe the sofa deteriorated over the years and ended up in the bar of a flophouse in the Red Light district of Portsmouth. But is the sofa that a murderer did not sleep on truly an historic artifact? Maybe not, but I'd love to know where it is today.